Dave Kopay made headlines in 1975 when he became the first NFL player and one of the first professional athletes to come out. His autobiography, now in its fifth printing, was a New York Times best seller. The second of four children, Kopay was born in Chicago into a strict Roman Catholic family. When he was in grammar school, the family moved to North Hollywood, California. Kopay began his football career at Notre Dame High School in Los Angeles, a school known for its championship athletics. He was named to the all-Catholic conference all-star football team. He enrolled at the University of Washington and as team co-captain led the Huskies to the PAC-10 conference title. 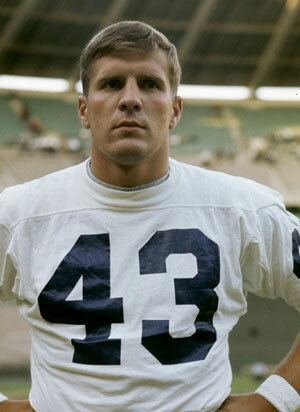 The following year, he was named an All-American running back. 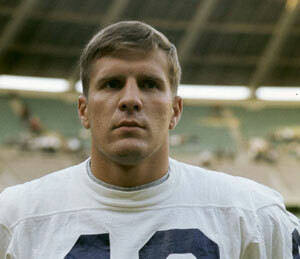 In 1964, Kopay was drafted by the San Francisco 49ers. He was the team’s leading rusher in his rookie year. He played for five NFL teams in his nine-year career, including the Detroit Lions, the Washington Redskins, the New Orleans Saints and the Green Bay Packers. While playing for the Redskins, Kopay had relationships with women and men, including teammate Jerry Smith, who died of AIDS in 1986. At the suggestion of his therapist, Kopay married a woman to try to fix what he perceived as a problem. The marriage lasted a year. Three years after retiring from the NFL, Kopay came out publicly in an interview with the Washington Star. He shared details about his struggle with homophobia and sports in “The David Kopay Story,” published in 1977. Kopay pursued coaching positions with NCAA and NFL teams, but believes he wasn’t hired because he is gay. Since 1982, he has worked in his family’s business. Kopay is one of the founding Gay Games Ambassadors, and has been present to support participating athletes and artists at every edition of the Games. A champion of gay rights for more than 30 years, Kopay has given hundreds of speeches and media interviews. In 2007, he donated $1 million to the University of Washington’s LGBT center. Kopay resides in Los Angeles. October marks LGBT History Month — Launched in 2006, LGBT History Month in October honors 31 Icons—one each day—with a video, bio, bibliography, downloadable images and educational resources, and special features for students. The videos are available as a free download to organizations and the public.